The most productive students are the comfortable and organized students. Keep students organized in the classroom by setting up Student Desks with Backpack Hangers and Book Storage. The Lift Lid Desk for Early Childhood Classrooms is one of the many furniture pieces US Markerboard carries for young classrooms to make learning fun and efficient! Student Desks without Compartments are also available for simplicity when students have their own Lockers. 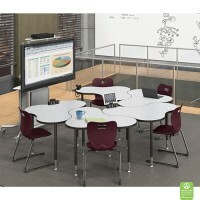 Huddle Desks for group work make it easy for many students to come together and fit their desks perfectly in a circle or arc for efficient collaboration. For space saving ideas, try the 2 Person Desk and have grouped desks to leave more floor space in your classroom. When it�s time to take tests, instead of propping books up to keep children�s eyes on their own tests, try Desk Top Table Privacy Screens. ADA Compliant Desks make it easy to adjust Desks for any handicapped students. Adjustable Desks also make a comfortable fit for different heights when you teach a classroom of growing students! The Standing Desk or Sitting Desk with Footrest Bar is a way for children to get energy out and boasts health benefits! Try a Desk with a Foot Swing and enjoy a noiseless and more focused classroom! Seat students in comfortable Student Desk Chairs that won�t cause fatigue and back pain! 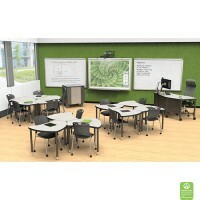 Try any of these Student Desks and Desk Chair Combos to fill your classroom and prepare children for Lectures and Presentations. These Student Desks also come in several colors, so show your team pride and school pride by getting Student Desks in your school colors!